This month I have being wanting practically everything I see so I had to create a wish list. I have added a lot of Zoeva products which are very popular with bloggers. Their products are super cheap and look almost like MAC products but don't break the bank. I know that it's nearly winter but these cute t bar shoes are a must. They are super vintage and look great with trousers or dresses. Another palette I'm loving is the & Other Stories quad. The shades in this palette are gorgeous and perfect for winter. I love knit wear and this bargain jumper from New Look is perfect for them cold days . 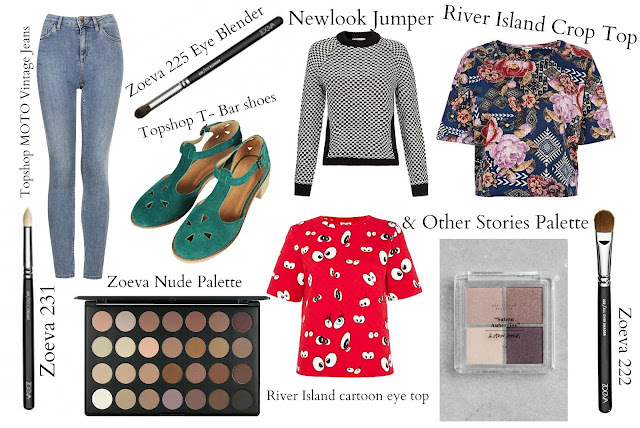 The vintage jeans and River Island are perfect together as an outfit and would work both for casual or formal errands. Lastly is this fun River Island Cartoon top which makes me so happy and would look great with the Topshop jeans and t bar shoes. I love the jumper, it looks so snug. that crop top from river island is beautiful! I've had my eyes on that Zoeva palette as well!! I want it badly!